Professor of the humanities since 1992, dealing with the philosophy of culture, pedagogy, the history of ideas, and epistemology, identified with the critical tradition of the Frankfurt School at the meeting of semiotics and psychoanalysis, he deals with the theory of identity and the theory of duality. He delivered papers and lectures in Italy, Switzerland, Canada, and the USA, among others; he also organised international philosophical congresses in Olympia, Greece (2003) and in Krakow (2001). Organiser of national congresses on philosophy and pedagogy (Toruń, 1995). In the years 2001-2003, president of the International Society for Universal Dialogue in Boston. In 2009, he received the prestigious W. Spasowski Award of the Polish Academy of Sciences for the best publication in the field of pedagogic sciences in the years 2004-2008; in 2010, he was nominated for the Długosz Prize for one of the top ten books on the humanities at the Book Fair in Krakow; and in 2011, he won the online poll for the best book on pedagogy of the previous year. 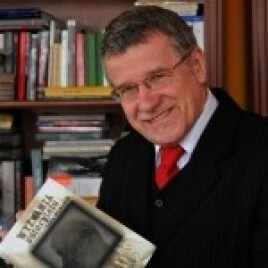 The latest of his 20 books include: Przełom dwoistości w pedagogice polskiej. Historia, teoria, krytyka (2013); Historie autorytetu wobec edukacji i kultury (2011); (with Henry A. Giroux), Edukacja i sfera publiczna (idee i doświadczenia pedagogiki radykalnej) (2010); and Wyzwania autorytetu w praktyce społecznej i kulturze symbolicznej (2009). Together with Michał Paweł Markowski, Agata Bielik-Robson and Krzysztof Kłosiński, Lech Witkowski will discuss about The policy of sensitivity. How to deal with humanities today? on 23rd October at 7:00pm in The Pod Baranami Palace.